This blog is written to give engineers a basic understanding of an often forgotten, but still relevant two-phase cooling solution – thermosyphons. Recently, I visited the Henry Ford Museum in Michigan. A fabulous place that’s steeped in the kind of history that reminds one that the ‘tech revolution’ started well over one hundred years before our modern use of the term. I’m talking about more than just the innovation that allowed the Model-T’s assembly time to be cut from 12 hours to 2.5 hours. It was an effort in materials innovation coupled with a desire to keep things as simple as possible, in some cases eschewing innovation for less costly, more dependable solutions. The decision to rely on an atmospheric radiator cooling solution is one such example of simplicity in place of innovation. Although pumped liquid cooling was in use by Daimler at the time, Ford decided he didn’t need the added cost or point of failure. The solution is known as a thermosyphon, which is a simple open or closed loop self-pumping mechanism that relies on the fact that hot water rises while cool water sinks. As the water in the engine block channels is heated, it’s forced up and into the radiator, where it is cooled and sinks to the bottom of the block where the cycle is repeated. 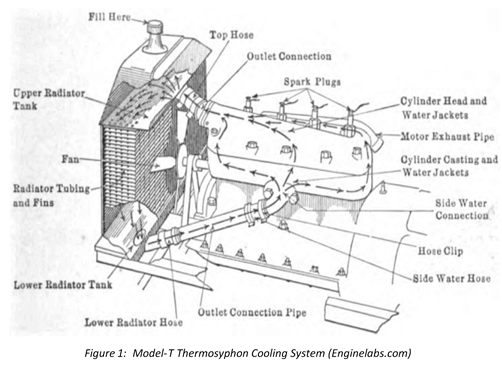 Thermosyphons are still used today in solar heaters and furnaces, but it’s their use in electronics cooling that I want to focus on today, albeit in a slightly different form. 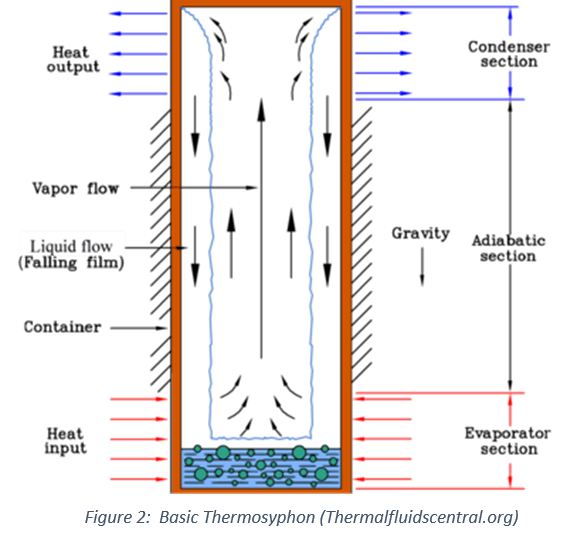 Certainly, the first step in the discussion should be to understand what’s generally known as a heat pipe thermosyphon. Let’s compare them to standard heat pipes in terms of design, limitations, and benefits. Thermosyphons used for electronics cooling are known as “Heat Pipe Thermosyphons” (HPTS) because they mimic their heat pipe counterparts in all but one way: the wick structure is fully or partially removed. But, why is this important and how do they work without this seemly critical component removed? As you know, the wick structure inside a heat pipe is used to move liquid from the condenser to the evaporator after is has changed state from vapor to liquid at the condenser (fin stack). This capillary action allows efficient liquid transport even if the heat pipe is in an orientation that is neutral or against gravity. Without this built-in liquid transport mechanism, HPTS must rely on gravity to move the liquid back to the heat source (Fig 1 – Thermalfluidscentral.org). For this to occur, the angle should generally be greater than +5 degrees with the evaporator below the condenser. The sintered wick lining the walls of a heat pipe reduces the available vapor space, a key component to determining a device’s Qmax. This isn’t a problem for heat pipes as it’s the capillary limit that determines its ability to transport heat. The chart below shows Qmax for various heat pipe sizes where the evaporator is directly below the condenser (+90 degree orientation). 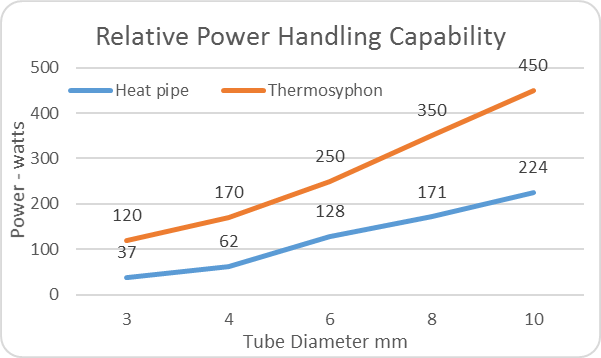 Wickless thermosyphons of the same diameter as heat pipes have 100-200% higher Qmax than the heat pipe counterparts, all because of the additional vapor space. See Celsia’s heat pipe performance calculator. 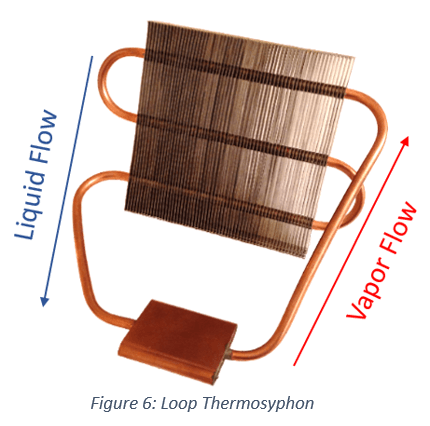 The simple reason thermosyphons operate more effectively over longer distances has to do with the ease with which liquid can travel from the condenser to the evaporator. With a heat pipe, the water is transported through the wick structure which is usually porous sintered metal. In a thermosyphon, water easily flows back to the evaporator along the smooth or grooved inner walls. While a heat pipe’s practical heat transport limit is on the order to 1 to 2 meters, a thermosyphon can easily carry heat distances over 10 meters. This usually isn’t an issue with electronics cooling as most applications will use these devices in distances less than a couple of meters, but worth mentioning nonetheless. The fluid level required for a thermosyphon generally covers between 20-80% of the length of the evaporator, assuming the vessel is in a vertical orientation. This is significantly more than traditional heat pipes and can be problematic if water is used in conditions where they are exposed to freezing temperatures. After repeated freeze/thaw cycles, the expansion of water will form bulges in the pipe, eventually fracturing the tube wall. For HPTS designs using other fluids, freezing is generally not a concern. 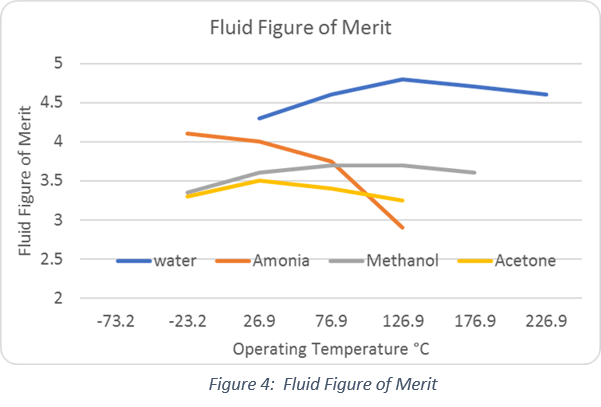 Water (used in a copper system) is the highest performing fluid for most electronics temperatures followed by alcohols and then refrigerants. The advantage of non-water based working fluids is their ability to operate below freezing temperatures. Common combinations with proven life are copper/water, copper/alcohol, aluminum/refrigerant. There are several variations of this basic design that can improve thermal performance and/or reduce the possibility of structural damage due to freezing. A grooved or mesh wick will reduce thermal resistance, enabling higher power densities in the evaporator. However, this solution will do nothing to prevent damage caused by freezing as the same amount of liquid is required. Sintered wicks will lower the thermal resistance to the greatest level. It also allows optimization of the fluid charge, effectively reducing the required liquid. This all but eliminates the possibility of damage caused by freezing. 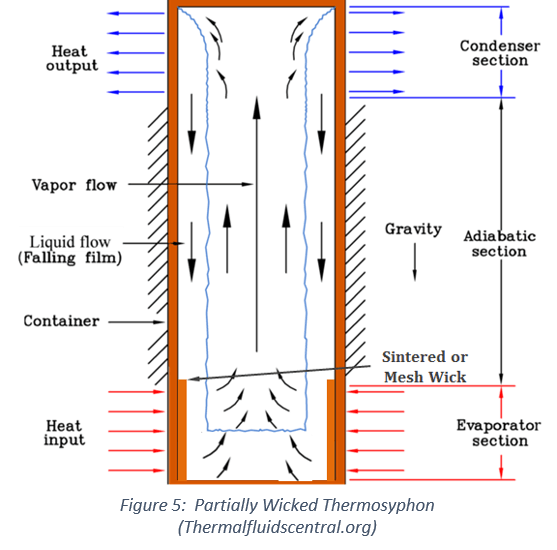 In the bottom portion of the above figure, note that the wick is only used at the evaporator section of the thermosyphon. Lastly, a looped thermosyphon can be used to separate the vapor flow from the liquid flow, further increasing Qmax. The vapor flow leads directly to the condenser where it cools and returns to liquid which travels back down to the evaporator. In the configuration to the right, the hollow evaporator at the bottom of the device uses a mechanism to prevent vapor from traveling up the liquid flow section, but still allowing liquid to flow in. The addition of a sintered wick to the evaporator allows less water to be used, decreasing the risk of damage caused by freezing. Taking into account both the advantages and drawbacks of thermosyphons – when should they be used in electronics environments? Historically the number one use for these are in power electronics applications and recently some use in data centers. Power electronics would include stationary motor controllers in places like steel mills, mining etc. Also moving applications such as light rail and subway systems. Recently there has been renewed interest for data center applications as they move towards higher ambient temperatures and a reduced number of fans. Cooling in data centers accounts for about 33% of the operating costs, with cooling fans accounting for almost half that figure. In summary, thermosyphons are still a relevant technology for cooling high power applications where the evaporator is below the condenser. Applications include power electronics such as IGBTs as well as radar systems, transmitters, and alternative energy generation.